And so Jessica did. 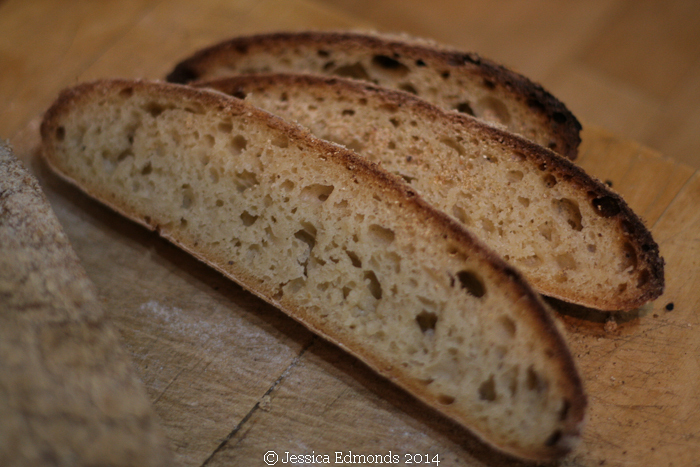 I’m very grateful to Jessica who sent the pictures she took and the recipe notes for her bread so I may share it more widely. Mix up the ingredients for the poolish in the evening before you want to bake. Leave at room temperature overnight for 9 hours or so. Then add the poolish to the remaining flour and the salt and mix well. Jessica left the dough to bulk prove and gave a stretch and fold. 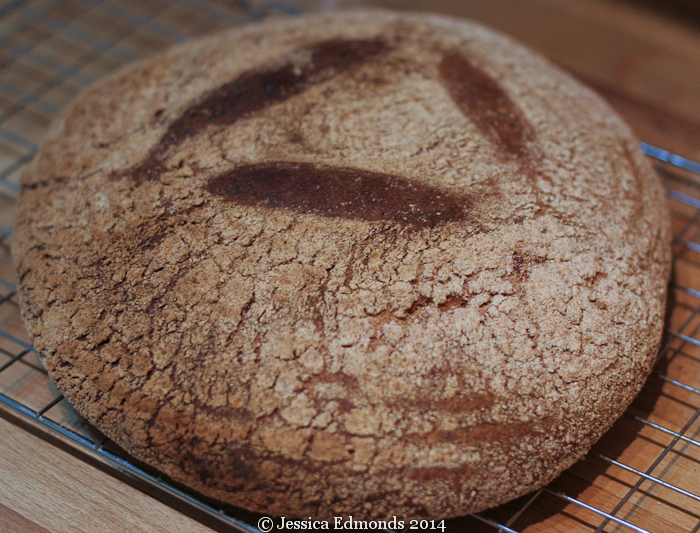 See the first video in my how to make sourdough post. After the bulk prove, Jessica shaped the bread and put it into a floured banneton to prove. Once proved, Jessica baked the bread on a hot stone at Gas 7 (220°C) for approx 50 minutes without any steam. Here’s Jessica’s view of what she’d baked. 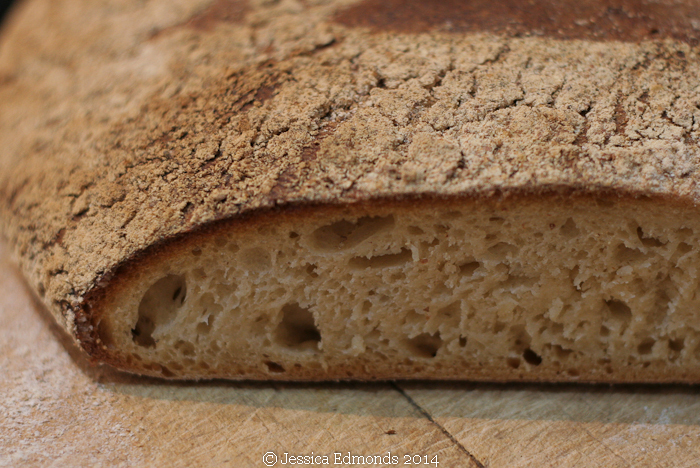 Open crumb, but a slightly sticky glutinous texture that didn’t dry out after a couple of days. Taste sweet, nice but quite hard to describe. 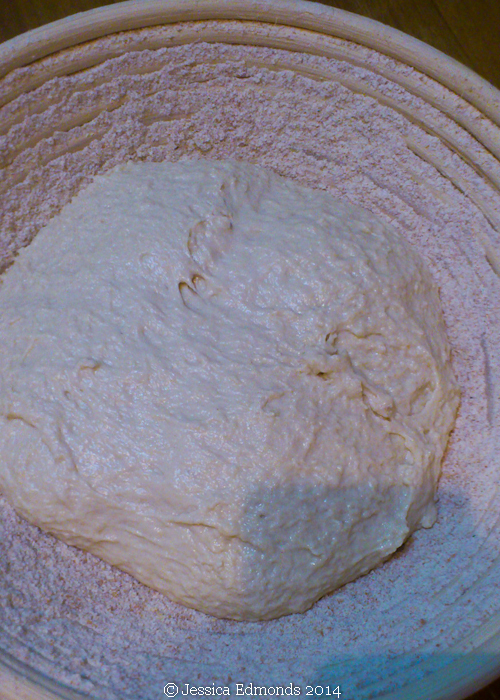 Profile a little flat, dough felt resistive and gluten strong during kneading, but perhaps would have benefitted from a couple of stretch & folds at hourly intervals prior to going in the banneton. Overall really pleased with the result: happy that elements of the wine-making process aren’t going to waste & will definitely do it again. This is a very worthwhile experiment, I’m grateful to Jessica for sharing it with us. I think that the ratio of water to dry ingredients seems quite high (at 75%). 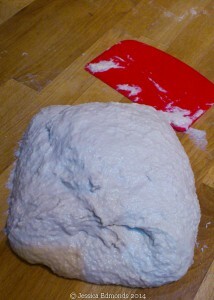 This makes a very wet dough which make it quite tricky to handle and more likely to produce the flat profile. 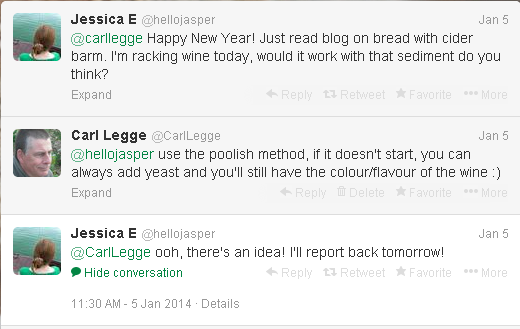 I would like to try this with 390g of wine barm which is 65% of the dry ingredients. 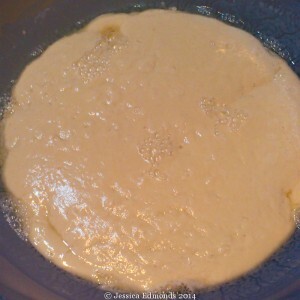 I agree with Jessica that the dough could benefit from some more stretch and folds. It would be good to try 3 hourly stretch & folds in the bulk prove. And aren’t Twitter and blogs a great way of sharing information, inspiring people to try new things and as a resource of collective knowledge? Have you tried anything similar yourself? What do you think of Jessica’s experiment?